Suppose I have CA1 root certificate and two intermediate CA2 and CA3 certificates issued by CA1. Would it pose any security issue if all of the intermediate certificates were installed in the root store? I'd like to know what's the purpose of this intermediate certificate store and when should I use it. I understand that it is created to store intermediate certificate authorities, but is there a reason why it was created specifically and why I can't keep all my certs in the root store? Would it pose any security issue if all of the intermediate certificates were installed in the root store? Yes. Root-CAs are a pain to revoke. That's why the intermediate-CA idea became popular some years ago. Intermediate CAs are much easier to revoke. Speed. It's a cache that Windows uses. ...and when should I use it. It is entirely organizational. You may place your certificates wherever you want. The advantage of this is that the root CA can be used less and kept in a more secure situation, while the different functions can operate independently of each other and compromises of one ICA won't affect other functions. Not the answer you're looking for? 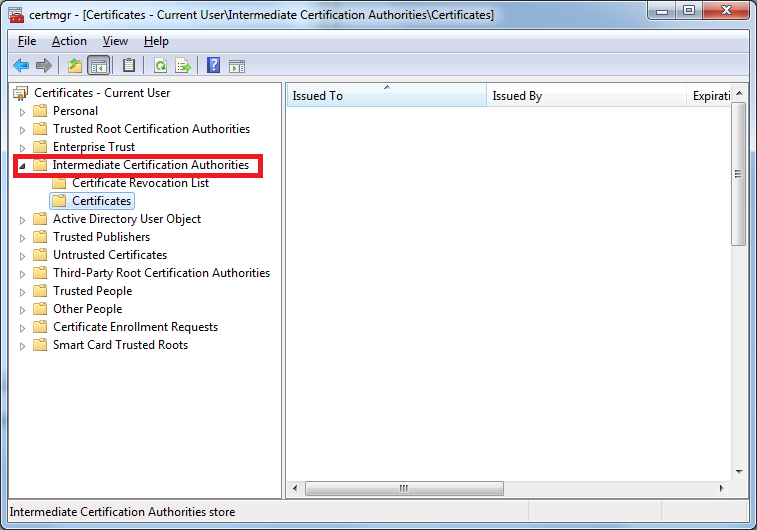 Browse other questions tagged tls windows certificate-authority or ask your own question. What is the purpose of the CA-BUNDLE on a webserver?